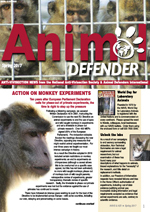 Welcome to the Animal Defender Magazine, Spring 2017. We have selected our key articles for you to read - just click on the links below! This publication was supported with the AW Blackwell Bequest.